One of the greatest joys of traveling is bringing home loot, whether for yourself or for friends and family. Some travelers purchase objets d’art, others, clothes and accessories. Me? I almost always go for food and kitchen knick knacks. I just spent three weeks in Singapore (for a friend’s wedding) and Viet Nam (for a two-week R&R with my hubby). And I have plenty to show for it! I scored most of my finds in the lovely town of Hoi An on the Central Viet Nam coast. My husband and our friends attended a market tour and cooking class organized by the Morning Glory Cooking School and we were introduced to all manner of local fruit and vegetables, as well as kitchen gadgets. A girl can’t have too many peelers, no? 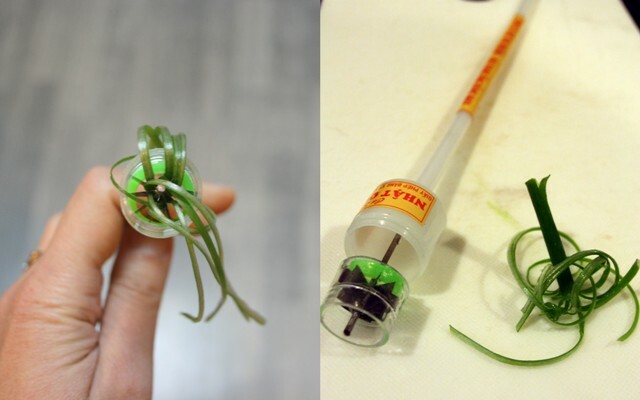 This Y-peeler, etc., is excellent for skinning cucumbers and shredding green papaya (I saw many street vendors wielding this same tool) but the main reason I bought it was because it can transform a lowly carrot into beautiful rosettes! Here we have an unusual instrument that transforms morning glory–a.k.a. kangkung, a.k.a. water spinach–stems into sprightly blossoms. It works with spring onions too. The label on this nifty tool reads” Instrument to split convol(v)ulus vegetable made of inox metal.” I used it to split a green onion instead. Green onion “blossoms” and cilantro sprigs are scattered over a bowl of pho. And my final toy is a peeler/slicer/knife, a gift from the cooking school! We used it to shred mango for our salad. 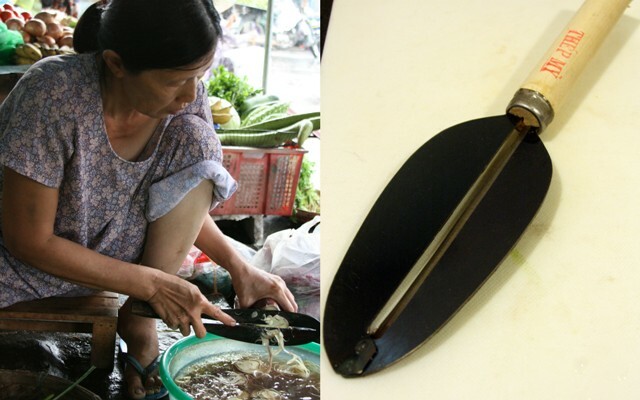 I saw women using this versatile knife to shred lemongrass, banana blossoms (see below) as well as using it like a regular knife. A quick search on the internet reveals this is a traditional Vietnamese knife called a cai bao (this link has a video that demonstrates its use but the selling price seems a little exorbitant to me) or dao bao, depending on where you look. During the cooking class, we were taught to make vertical cuts into the mango flesh from the seed’s tip to its bottom using the knife’s edge. Then, I used the center blade (which kinda acts like a peeler) to scrape off the flesh which came away as shreds. Strips of semi-ripe mango are tossed into a tasty salad. My husband made this plate all by himself during our cooking class! I’m thrilled to add these kitchen gadgets to my collection and can’t wait to use them. I didn’t see any of them at my nearest Asian market (which is 99Ranch) but I’ll try the Vietnamese markets next time. Have you spied any of these tools at your local Asian Market? And have you brought home a unique kitchen gadget from a trip abroad? Do share! Next postA Multi-Culti Christmas and New Year To You! 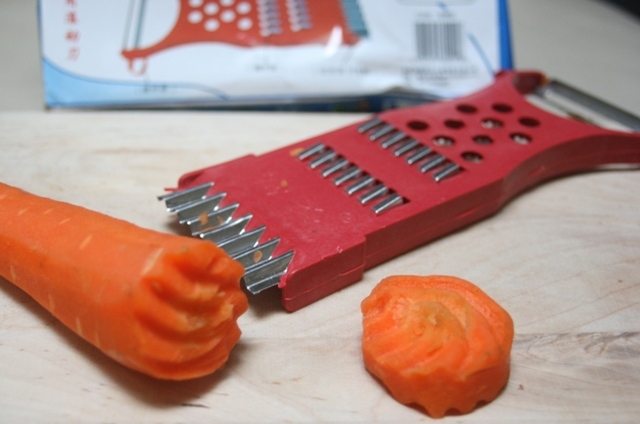 Can you tell me where I can buy the magic multi purpose Y peeler used in Vietnam. I live in NZ or an online address to purchase. Hi Margaret, I’d try an Asian market if you have one nearby. Or search online? Sorry I don’t have a more concrete lead for you. Good luck! Thanks Pat. I have been to the Asian markets in NZ and searched online, but to no avail. Have contacted The Red Bridge Cooking School where I bought a couple but I need some more for friends. please tell me where I can order both of the water spinach splitter and the unique peeler on line? Well we are kindred spirits because I do this everywhere I go. In fact this past spring in Italy I bought all these wild gadgets that made coils out of carrots, strips, fancy shapes from a very engaging Egyptian vendor in the Campo di Fiori in Rome. He would make a fortune on the Shopping Network! Everyone bought something from him. Have I used them yet (bought them last April)? No, but I am sure I will…someday! I have a few great photos if you would like me to post them. I can send them to you. Hi Debra, I’d love to see some photos. Will you send me some? Yes, we are indeed cut from the same bolt of cloth! I just used the stem splitter tonight. One of the best (and cheapest!) kitchen tools ever! I love your kitchen tools ~ I do the same when I travel to Manila and around Asia, head for the kitchen and house ware section. The open markets are the ones I love to dive into. Thanks for sharing, Pat ! Hi Betty Ann, isn’t it so much fun to rummage around the markets and find cool gadgets? If you have photos, do send me some and or post them to pinterest or my FB page! Happy holidays!